This week it's Macy's, which says it will close about 15% of its stores in early 2017. But shuttering stores has been a common occurrence for retailers over the past few years. People still get in the car and drive to the mall or big box stores to shop. But not like they used to. Call it the Amazon (AMZN) effect. Macy's (M) latest store closures come after the company said it planned to close 40 stores earlier this year. Many Macy's stores serve as anchors in malls, so their absence may affect other stores. Given the issues facing department stores in general, finding a replacement tenant may not be easy, which could hurt entire malls. 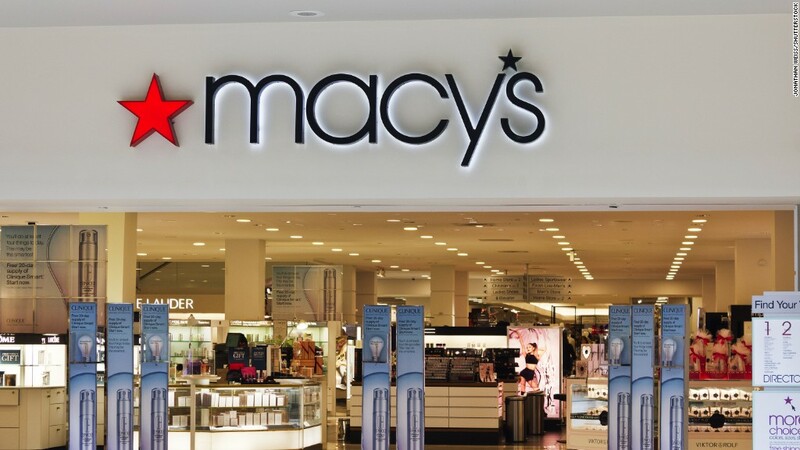 Macy's will have 628 stores once the closures take place. Before the retailer filed for bankruptcy in October 2015, American Apparel had already laid off workers and closed several stores in an effort to right the company. American Apparel has 116 stores, according to its website. Gap (GPS) said in June 2015 that it planned to close 175 stores in North America. The closures wouldn't affect its other brands -- Banana Republic, Old Navy, Athleta and Intermix. Gap outlet and factory stores also weren't included in the list of stores being closed but the closures did extend to some locations in Europe. Gap Brand has 2,406 stores, according to its website. JCPenney (JCP) said it would close seven stores this year. The company already closed 74 locations over the past two years. As of its most recent federal filing, JCPenney has 1,014 stores. Tailored Brands said in March that it would close about 250 stores: between 130 and 140 Jos. A. Bank locations and 100 to 110 Men's Wearhouse Tux stores. It put an end to its signature "buy 1 get 3 free" suit sales in October 2015, but the move backfired and was much more expensive than anticipated. As of Tailored Brands' most recent federal filing, there are 1,484 Men's Wearhouse and Jos. A. Bank stores. Kohl's (KSS) said it planned to close 18 of its most underperforming stores in 2016. Kohl's has 1,167 stores, according to the company's most recent federal filing. The company declared bankruptcy in February 2015 and said it planned to close about 1,600 stores. It did sell 2,400 locations, and Sprint created a "store within a store" in around 1,750 of them. Sears Holdings (SHLD) announced in April that it would close 10 Sears stores and 68 Kmart locations to return to profitability. The retailer hasn't been profitable since 2012 and recently got $1.2 billion in debt financing, which it put toward revamping its business. As of Sears Holdings' most recent federal filing, there are 1,622 Kmart and Sears stores. Sports Authority closed all of its stores in May. The company, which declared bankruptcy in March, initially only planned to close 140 of 450 stores. However, it wasn't able to find someone to buy its remaining stores. The office-supply chain plans to close 50 stores in 2016. That's in addition to the 225 store closures it announced in March 2014 and the 40 store closures it proposed the year before. Staples (SPLS) has over 1,400 stores, according to its most recent federal filing. Target announced 13 U.S. store closures in November 2015. Target has 1,793 stores, according to its most recent federal filing. In an effort to rebound financially, Walmart (WMT) said in January that it planned to close 269 stores in 2016. Of these, 154 are located in the U.S. -- two-thirds of which are Walmart Express stores. Most of the closures were located within 10 miles of another location. Only 12 Walmart Supercenters and four Sam's Club stores are scheduled to close. Walmart has 4,601 stores and 652 Sam's Club stores, according to its most recent federal filing.